Abstract: The fivehundredth article has been published in the Encyclopedia of Laser Physics and Technology. The article makes some remarks about the past and future development, and about possible uses of the encyclopedia. Shortly after its second anniversary, the Encyclopedia of Laser Physics and Technology got its fivehundredth technical article a few days ago. It is nowadays covering a huge range of topics in laser technology, and beyond that in a number of related technical and scientific areas. Particularly in 2006, the main focus has actually not been on increasing the number of articles, but on further improving the quality of existing articles. For example, quite a few longer articles have now obtained a clearer structure with subheadings. And whenever I read something interesting or get across things at conferences, I consider to include some additional materials in the encyclopedia articles. What also sometimes helps is user feedback, delivered mostly via the feedback form. Apart from being very encouraging, it makes me aware of missing aspects, errors, useful new references, etc. Actually I would welcome very much to get even more feedback from the readers. Only one type of “feedback” I really hate: spam is now also delivered via this channel. Another interesting number: the total number of page hits of the encyclopedia is soon going to exceed 100,000 per month – not counting those hits caused by search engine robots. Many thousands of visitors are using the encyclopedia, and due to the excellent placement of the content in Google and other search engines, they are getting more and more. Many users seem not to care where the content is coming from, but a substantial percentage of the new customers of RP Photonics Consulting are those who just stumbled into the encyclopedia during a web search and then realized that behind this resource there is a skilled technical consultant who can bring substantial benefits for their development team. What has not yet been widely realized is the possibility of advertising with banners and links in the encyclopedia. I think there can hardly be a better focused type of advertising than a link to a manufacturer in a box above an encyclopedia article which is directly associated with the offered kind of product. But people have maybe not yet recognized how intensively used these encyclopedia articles are – they often get many hundred page hits per month. Also, they often seem to be aware that for the cost of a single print ad, they could advertise in several articles of the encyclopedia over many months, in total getting more readers and more specifically interested ones. Anyway, the main purpose of the encyclopedia is to be a valuable resource of information for the readers. It will continue to serve this function and will stay an open-access resource. 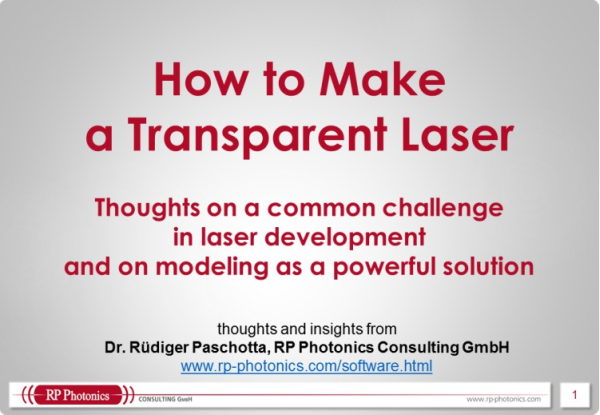 RP Photonics is proud to serve in this way both the laser industry and university research.